Helsinki: Finland’s leftist Social Democrats won a razor-thin victory in Sunday’s general election, holding off the far-right Finns Party which surged on an anti-immigration agenda. Meanwhile the Finns Party, which won 39 seats, had focused almost entirely on an anti-immigration agenda under the leadership of hardline MEP Jussi Halla-aho, who also decried the “climate hysteria” of the other parties. Only 0.2 per centage points separated the two parties — in a heavily splintered political landscape where the Social Democrats were the biggest party with 17.7 per cent of votes. The Finns Party has seen a surge in support in recent months, urging people to “Vote for some borders” and pledging to reduce Finland’s asylum intake to “almost zero”. During the campaign, most parties expressed strong reservations about sharing a government platform with Halla-aho’s party, while stopping short of ruling it out entirely. The Social Democrats’ Antti Rinne has previously said his party would find it “very difficult” to enter a coalition with the Finns Party. But after declaring victory on Sunday, Rinne did not rule out a collaboration, saying he “has questions” for the party. Although the two parties have repeatedly clashed over the conservatives’ austerity policies during the last four years, political commentator Sini Korpinen told AFP the pair would more than likely choose to collaborate in order to keep the Finns Party in opposition. “It’s very hard to see that the other parties would say no to the Social Democrats, because then we would be in a situation with Halla-aho trying to form a government and I just don’t see that happening,” Korpinen said. Outgoing Prime Minister Juha Sipila said his Centre Party was the election’s “biggest loser”, blaming the “difficult economic decisions” his administration made in an attempt to rebalance the economy after a long slump. The current government’s cuts to Finland’s prized education system, and a tightening of unemployment benefit criteria, had provoked loud and widespread public opposition. Rinne has been a staunch opponent of the National Coalition’s austerity policies over the past four years. And Petteri Orpo, leader of the conservative National Coalition Party and co-architect of the government’s savings programme, has denounced the Social Democratic Party’s anti-austerity plans as “irresponsible”. 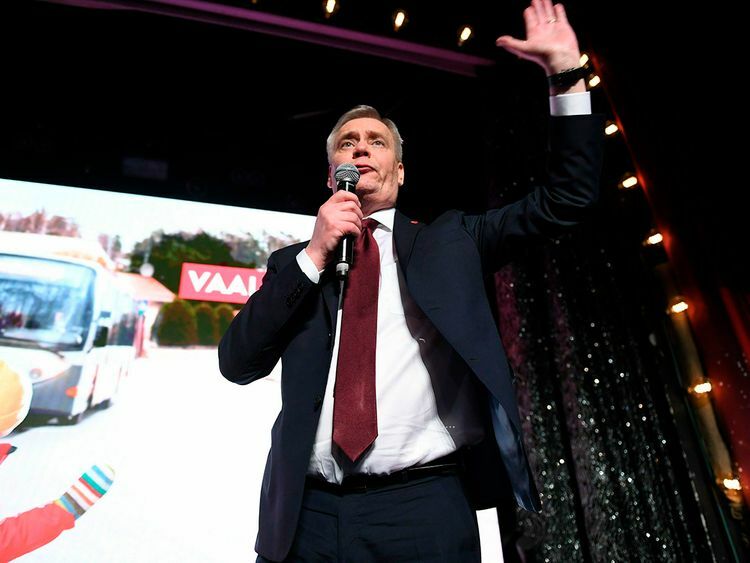 Opinion polls had suggested the Social Democrats’ lead was narrowing towards the end of their campaign, with some blaming Rinne’s inability to attract large numbers of new, younger voters. On Sunday he said his party was open to being in a coalition “but not at any cost”. The Finns Party does have previous experience of being in government, when they became the second-largest party in the 2015 election.